The Artists Crossing gallery opened in December of 2008, as one of the four temporary BRA holiday artist stores. We had a wonderful month–both our neighbors and our customers loved us, were happy we opened, and encouraged us to stay. We made an arrangement with the Druker Company (thank you!) to remain open with a month to month lease. We stayed open full time on Bromfield Street until the summer of 2011, when our space was rented to a long-term tenant, and thanks to Northland Investment Corporation we moved to 505 Washington Street. We had that space until January of 2013; the entire block is currently being turned into a boutique hotel. We moved to 50 Franklin Street, thanks to Linear Retail this time. This was rented in October 2013 so in November we moved to 431 Washington Street– in between Bath and Body Works and E.B. Horn, at the corner where Winter Street turns into Summer. The last space at 44 Bromfield Street, practically where the journey all began, closed in 2015. The gallery was cooperative — the artists paid a small monthly fee and a small commission on sales. The artists ran and staffed the gallery. There was a special exhibit that changed each month, usually featuring a new local artist. Occasionally it featured a joint or group show. We had a monthly artist reception, as an opening for the exhibit and also for people to meet all the artists. Some artists were full time members and had been with the gallery since we first opened. Others showed their work for a month or two. The number of participating artists was usually around 20. The artwork changed constantly, since it was all original. As pieces sold, the artists replaced them with new pieces. There was always something new to see! Artists Crossing evolved into an Arts Events Organization, and brought all of the shows Jen has run under its umbrella. At some point in the future, Artists Crossing gallery might once again find a home in Boston to champion the work of local artists. Our main focus now is to support the local arts community by continuing to bring great events such as The Beacon Hill Art Walk and The Boston Arts Festival to the city of Boston. The Gallery opened in December of 2008, as one of the four temporary BRA holiday artist stores. We had a wonderful month–both our neighbors and our customers loved us, were happy we opened, and encouraged us to stay. We made an arrangement with the Druker Company (thank you!) to remain open with a month to month lease. The artists paid a small monthly fee and a small commission on sales. The artists ran and staffed the gallery. There was a special exhibit that changed each month, usually featuring a new local artist. Occasionally it featured a joint or group show. We had a monthly artist reception, as an opening for the exhibit and also for people to meet all the artists. All of the shows Jen has run were brought under its umbrella. At some point in the future, Artists Crossing gallery might once again find a home in Boston to champion the work of local artists. 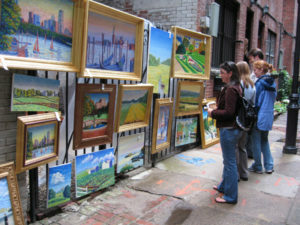 Our main focus now is to support the local arts community by continuing to bring great events such as The Beacon Hill Art Walk and The Boston Arts Festival to the city of Boston.